Several Grant County organizations are partnering to host a monthly Community Job Fair. 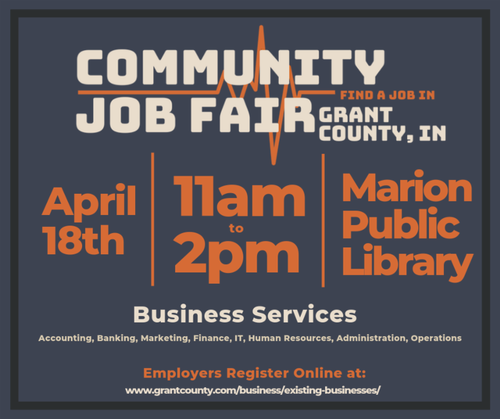 The Gas City Area Chamber of Commerce, Grant County Economic Growth Council, Marion-Grant County Chamber of Commerce, and WorkOne are working together to provide this opportunity from 11am-2pm on the third Thursday of each month at the Marion Public Library. Each month will have a different industry focus including: Healthcare & Human Services, Manufacturing & Logistics, and Business Services. Each Job Fair will also have opportunities for attendees to receive resumé assistance and practice interview skills. The third Job Fair will take place Thursday, April 18th from 11am-2pm at the Marion Public Library and it will focus on Business Services. Businesses interested in participating or finding out more information can visit http://grantcounty.com/business/existing-businesses/.